I turned 50 on Boxing Day last year! Yes the big five ohhh and I was presented with the most valuable gift of all, the gift of friendship. This gift came in the form of a cap, but not just any old cap. This cap has been lovingly passed around a group of friends for over three years now. A group of friends who came together as an unlikely gathering, pieced together by one couple who thought that it would be fun if the worlds of their individual friends were to collide. And collide they did, one evening five years ago. An evening filled with fun, laughter and frivolity, that spilled over into the wee hours of the morning. A new bond of friendship was born that night. One that was easy, comfortable, low maintenance and filled with laughter and delight. One that was repeated over and over again at dinners, lunchtime gatherings and even weekends away. It was an improbable friendship that would never have happened had it not been for the courage of one couple who put fear and awkwardness aside to see what would happen if you put a group of people, all from different walks of life, together in one room for dinner. The result was delightful. A colourful tapestry of individual threads combining to create an evening of excitement, laughter and a longing to get to know each other more. We became good friends over the next few years, celebrating birthdays as we went along. It wasn’t however until 2010 that a tradition was formed, one that would always unite us despite how busy life got. It was the night of 21 August 2010 the first one of many 50ths to be had. Presents were given, some serious and some hilarious (as always the case with this group). One in particular stood out, although we didn’t know the importance of it at the time. It was simply a cap with 50 painted on the peak and a 50th badge attached to the side. The next 50th birthday occurred one month later and the cap was in my husbands possession. He thought it would be funny to re-gift it, but with a personal message added. He glued some false eyelashes to the peak, which was a reminder of the 50th party we had all attended. Selwyn, the birthday boy, had dressed up as a transvestite wearing the most glorious false eye lashes. The cap was a hit and it was then that the idea took hold. 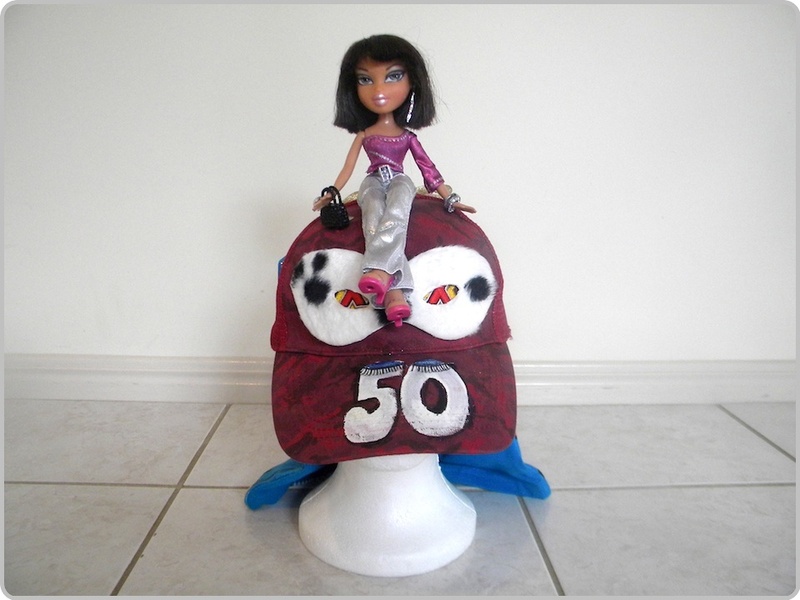 As a symbol of our friendship and to celebrate the big 50th’s that were rolling out, the cap would remain in the possession of the current birthday person until the next 50th came around. It was the responsibility of that person to add something special to the cap and present it at a birthday gathering in honour of that person. The cap has flourished in so many ways. 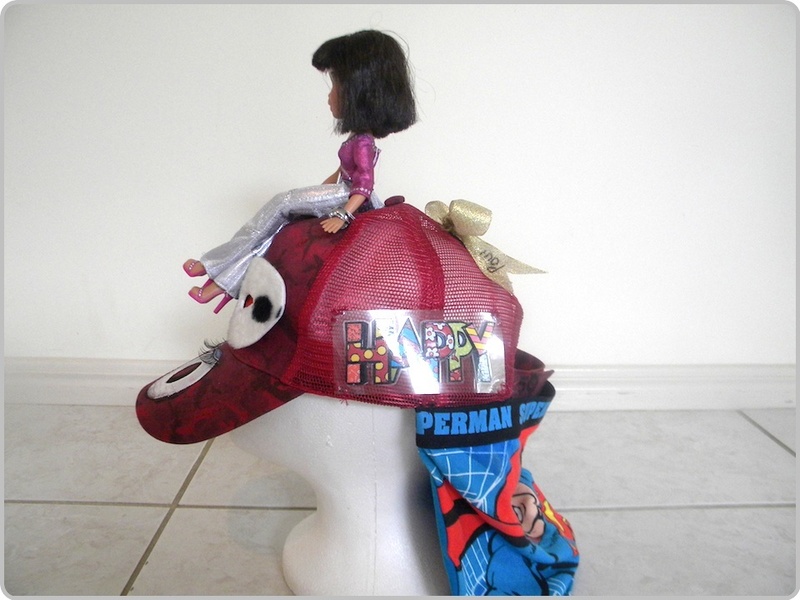 It has a pair of superman boxer shorts on the back, a gorgeous exotic doll sitting on top, a mask covered in cow hide and the latest addition was for me, a colourful happy sign which symbolizes my passion for happiness. Each addition has a special meaning to each birthday person. I only have the hat for a few more weeks and then I pass it on to the next birthday person. We only have two more 50th birthdays to celebrate and the hat will be complete. It will be back with the person who originally bought it and will remain there as a sign of our amazing friendship. Of course a new cap will be bought for the round of 60th’s but we won’t go there just yet. The cap is a symbol of happiness. Whenever I look at it I am reminded of all the wonderful times I have had with my friends and how grateful I am to have them in my life. Good friends are like food for your soul. They nourish you, they make you laugh, they are there when you need them, you look forward to seeing them and it doesn’t matter if you haven’t connected for a while, you just take up from where you left off. I am so lucky to have a wonderful circle of friends, each has their own special meaning to me and they feed my soul is so many different ways. How important are your friends to your happiness? I would love to know if they are a crucial component. Please add your comments below and share in the discussion, we all need a good cap in our lives! My friends have sustained me all my life, through good and bad times. And I have tried to reciprocate. To have a friend ,you have to be a friend, and many times my soulmates have been food for my soul and I could not have lived a fullfilling life without them. So true Diana, friendship is definitely a give and take even though our true friends will never accept anything in return. My life would certainly be empty without my friends. This was a magnificent piece. Thank you for sharing. I too experience moments that are not coincidences but messages as long as I keep my eyes and my mind open! Thank you and belated Happy Birthday. I’ll be happy to trade with you a decade! Thanks heaps for the birthday wishes Barbara and I think I will lovingly pass on the trade. So glad you related to the article, how exciting is it when you keep your eyes and mind open! !